The West Midlands Combined Authority (WMCA) has announced a package of commemoration and support for armed forces veterans ahead of the centenary of the Armistice. There are an estimated 76,000 veterans currently living in the West Midlands with those of working age nearly twice as likely to be unemployed than their equivalents in the general UK population according to research by the Royal British Legion. That accounts for 120,000 unemployed veterans nationwide in what is known as ‘the veteran employment gap’. The WMCA skills team has announced a new programme for veterans called “Joining Forces in Construction”. Veterans will be trained to deliver construction courses for young people with the WMCA skills team aiming to train 30 veterans in the next 12 months, creating a new generation of tutors for young people in the West Midlands entering the construction industry. Shaun Hall, the WMCA’s construction skills project manager, said: “Many colleges and training providers struggle to recruit sufficient numbers of teachers and trainers with the right skills to teach technical trade occupations. The Mayor is also rolling out his successful Mayor’s Mentors programme, currently working with 1,300 young people in the region, to members of the armed forces who are transitioning back into civilian life. “Mayor’s Mentors for Veterans” will link members of the armed forces with a business mentor when there is six months remaining of their military service. The mentor will support the transition from military to civilian life, supporting the mentee for 12 months in total. Further to these announcements Transport for West Midlands has also launched a commemorative Swift card for use on buses and trams in the region. The card has been designed by TfWM graduate Emily Perry and features a new limited edition Poppy design for the centenary. It is available online or in local travel stores for £11. 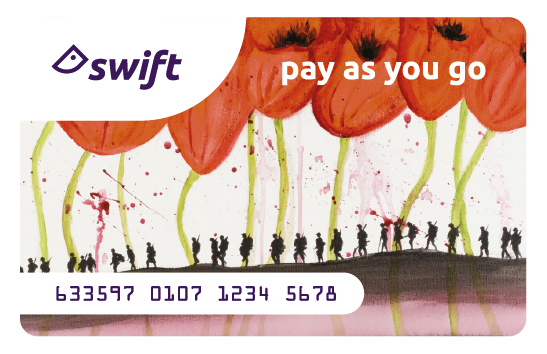 £1 will be donated to the Royal British Legion for every card bought. Speaking about the announcements, Mayor of the West Midlands Andy Street, said: “It is important to look after our armed forces who serve our country and region. “As Mayor I’m determined to represent and support our veterans community and these announcements today show that the WMCA is starting to think about how we can best support this community. I am pleased to be signing the Armed Forces Covenant at the end of the month on behalf of the WMCA. “The Armistice is important not only for our region and country but for the Commonwealth as well. Over one million Indian soldiers fought alongside our troops in the First World War and 16,000 men of the British West Indies Regiment served with the Allied forces in Passchendaele, Ypres and Poelcappelle, among many others. We must not forget their contribution which is why I am pleased that the statue of the Indian Sikh soldier was unveiled in Smethwick last week.